As I prepare for my upcoming vacation, I’ve begun rounding up what makeup I think I’ll need (which is usually way too much, as usual) but this year I’ve decided to impose certain criteria — if only to make it easier on myself … but more on that later. 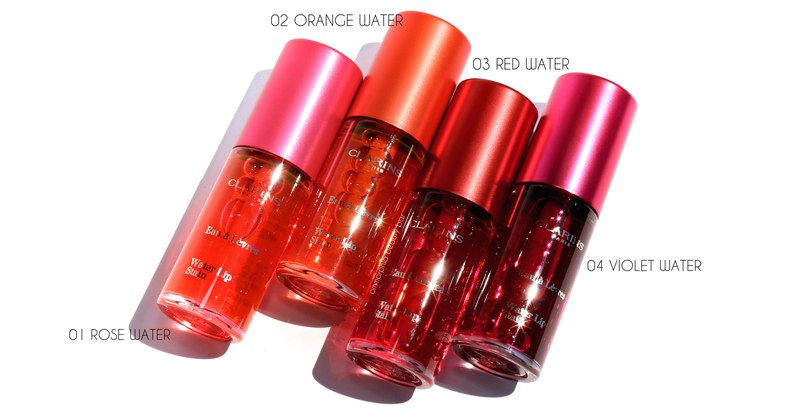 That said, when the Clarins Water Lip Stain shades came in the other day, I began testing them out pretty much immediately and so far, they’re definitely impressing me enough to make the cut. 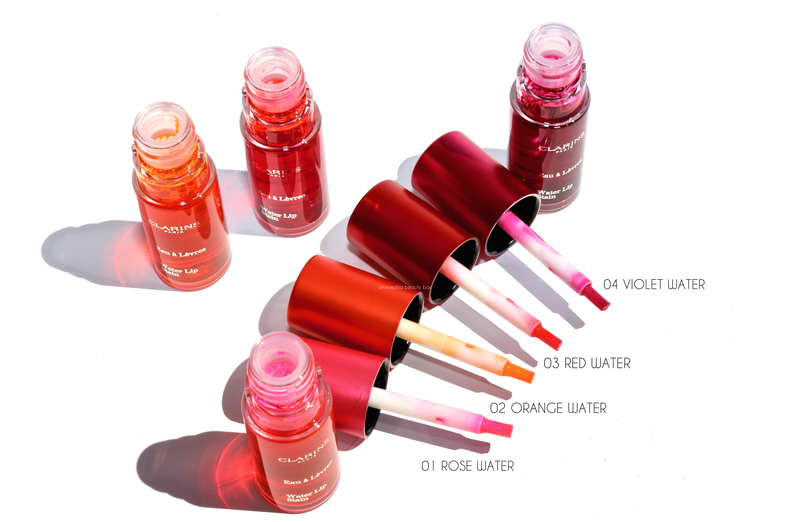 Water Lip Stain (CAN $25.00/each) | The concept is not exactly new; both Dior & YSL have their versions but there’s something quite interesting about these just the same. For starters, the formula which is composed of 77% water, is also rich in plant ingredients (Organic Raspberry Water & Organic Aloe Vera Extract) and boasts the brand’s Anti-Pollution Complex to help protect against external aggressors. Housed in a transparent tube with a cap coloured to match, the applicator is a small, dense & flexible brush that makes it easy to not only pick up the product for application, but helps in reaching corners and following lip contours as well. The texture is thin and runny – very much like water, in fact, so a little will go a long way, and provides an initial cooling sensation upon application (but which dissipates quickly after that). Here’s the fun part! 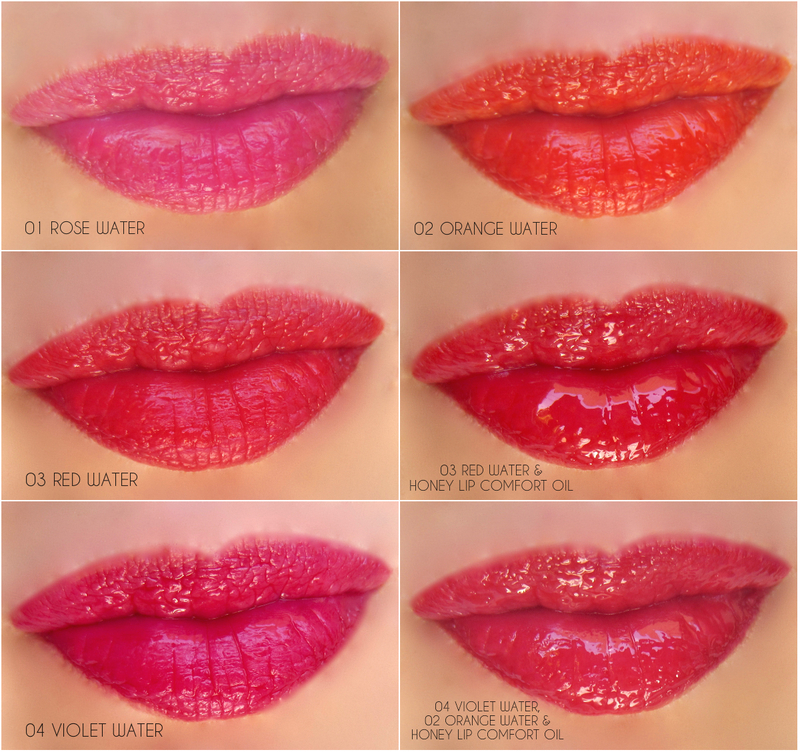 You can literally customize the colour according to your preferences; by wiping the brush along the inner rim before application, you wind up with less product and once brushed along the lips, you can take it down even further by lightly blotting — this gives the lightest flush of colour. If you’re feeling it, however, you can go in with multiple layers (just let them dry a bit in between) to not only ramp up the intensity, but increase the staying power as well. Note that these bear a sweet candy-like fragrance that’s actually pleasant and rather fun, but it doesn’t last all that much (which is a plus for those with sensitivities). Now that I’ve told you what these are all about, there’s a few more ways that they can come in handy. For starters, their staying power is amazing — although I can’t vouch for the “300 kisses” part (did someone actually test that by kissing 300 times?!). Next, is how incredibly comfortable these stains are to wear and unlike other products that dry down, my lips continue to feel hydrated throughout the wearing. 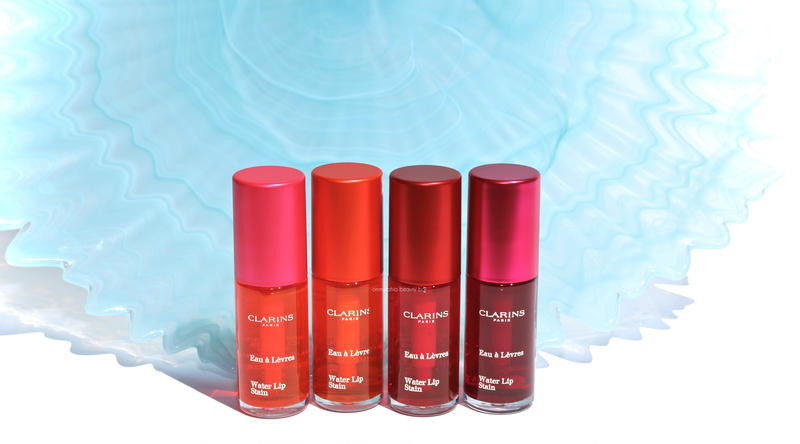 They can increase the longevity of any lipstick applied on top (no need to go in with a lip liner for the job, which in itself can be quite desiccating), and for those who want a bit of natural-looking lip when at the beach, a light swipe of one of these shades will see you through. You can also layer any of these shades together to create an entirely unique new combo (see the swatches below). 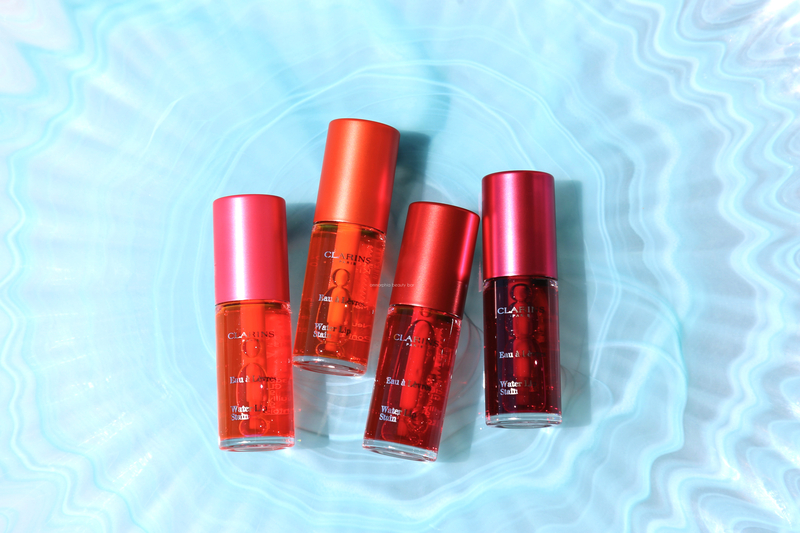 Said to dry matte, I found the finish to still have a tiny bit of sheen — which I prefer, in fact and when I layered a coat of the Honey Lip Comfort Oil on top, it was a HOLY MOSES moment; have you ever seen anything THIS glossy? Whoah, indeed. 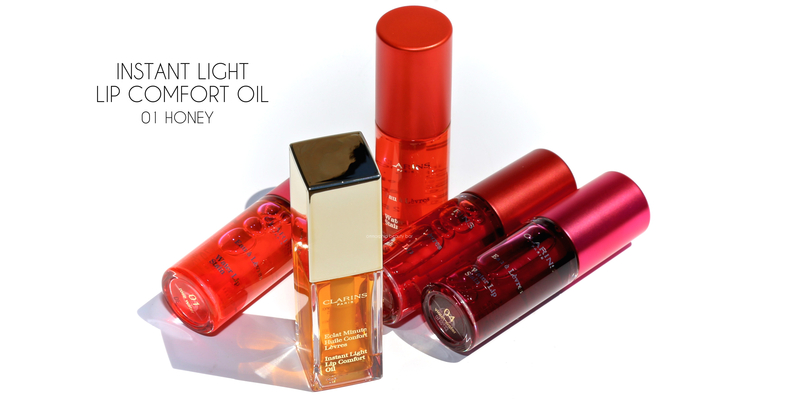 01 Honey Instant Light Lip Comfort Oil (CAN $25.00) | From the moment Clarins launched these oils, I have been a fan. The transparent rectangular casing is great for monitoring product usage and comes with a wide flocked paddle-shaped applicator that makes it easy to both pick up & apply the product. The texture leans slightly thick but doesn’t feel sticky, appearing to self-level along the lips, filling in ridges and lip lines as it goes. This version truly does have a honey fragrance that’s quite yummy, and I love how moisturized it leaves my lips feeling — not to mention the beautiful gloss it imparts. I stated at the top that I’m in the throes of trying to put my vacation makeup bag together and in order to make the process efficient (for once), I’ve decided to go with products that are A) lightweight, B) sweat & humidity proof, and C) multi-tasking. That said, the Water Lip Stains were actually put to a gruelling test yesterday as I went to play tennis outdoors, with a blazing sun overhead and a billion percent humidity. I figured if these can last through that, then they’ve earned a place in my bag. So now the only dilemma is which one to take … ugh, why are these decisions always so hard?